I feel as if every Skyfall review should come with a preface stating the writer’s level of James Bond fandom. I am a novice to the series, a “rook” if you will, as I have only seen a grand total of three Bond films — the very first two with Sean Connery (Dr. No and From Russia With Love) and Daniel Craig’s first outing (Casino Royale). I enjoyed all to some degree, but I wouldn’t quite call myself a fan — yet. With Skyfall, I feel myself being drawn back into the universe, one that seems more exciting now than ever. In this dark and rather bleak entry in the series, Bond is not quite as invincible as one might expect. Played to perfection by Craig, 007 is now old, broken down and even vulnerable. When MI6’s headquarters are blown up by the despicable villain, Raoul Silva (Javier Bardem), the British agency and its head, M (Judi Dench), are forced to rely on the rickety frame of Mr. Bond to save the day. Silva presents a great challenge for them, as he always seems one step ahead with every move he makes. He is an excellent villain — he has superior hacking skills, a seemingly endless group of goons at his disposal, and he has an entire bombed-out island all to himself. Javier Bardem, mildly ludicrous blonde hair and all, excels in the role, making for a dangerously strong adversary despite his physical deformities. 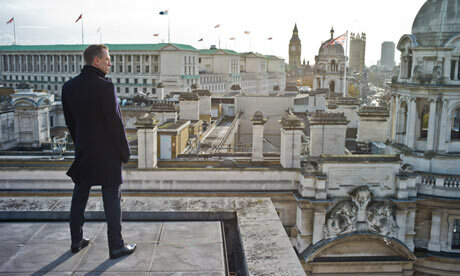 When it comes to Bond films, I am always most fascinated by the exotic locations, and Skyfall does not disappoint. From the thrilling opening car chase scene through the streets of Turkey to a brutal hand-to-hand combat sequence in a Shanghai skyscraper, there is no shortage of eye candy. The Shanghai scene, in particular, is visually stunning with its black silhouettes and flashing blue lights. A later visit to the gorgeous Scottish countryside also shows off the talents of cinematographer Roger Deakins (who also worked with director Sam Mendes on Jarhead and Revolutionary Road). The action set-pieces are flashy and loud, and for the most part this is a white-knuckled ride that rarely lets up. Since this is the 50th anniversary of Bond, there are nods and homages to every single film in the series. As a newcomer to the series, I obviously missed many of these, but I got a kick out of hearing the audience cheer in delight when some of the more obvious throwbacks were shown. Diehard Bond fans — most of whom likely saw this opening weekend — will certainly appreciate these tributes, subtle or otherwise. In many ways, Skyfall is similar to The Dark Knight Rises. Both films are centered around a hero who has seen better days, one who has hit rock bottom and has to work his way back up to help save the day. Both delve a bit into their backstories; in Skyfall, we learn a little about Bond’s origin, something that I greatly appreciated. There’s even a wink at the end of both films in which a familiar character is revealed in an ode to the future. It’s an interesting thought — Skyfall simply wouldn’t be the same if it were not for The Dark Knight trilogy. The bottom line here is that Skyfall is one of this year’s best action films, and being a Bond fan is not a prerequisite in really enjoying this. There are a few moments that could have probably been omitted — and surely a few of the groan-worthy one-liners could have been improved — but I can’t recall many trips to the theater this year that were quite as exciting. Count me in for the next one, Mr. Bond. Heh. Hey, an eight is pretty damn good in my book! Share a lot of the same thoughts on the film, I thought it was excellent if just slightly too long. Agreed. Really digging Daniel Craig as Bond. Great post, I loved this movie so much and I’m glad you enjoyed it. Thanks Vinnie, it was good fun indeed. It certainly was, you should check out my review of it. I’ll try to do so soon, V.
Heh, well I planned on doing that over the summer but only got to a few of them. 😀 I do have Goldfinger on the way, though. Eric, you should definitely at least check out Goldfinger, Thunderball, On Her Majesty’s Secret Service, The Spy Who Loved Me, and Licence to Kill. I also think Quantum of Solace isn’t as bad as people say. I’m with you on Skyfall. It definitely owes a lot to Nolan’s Batman films, especially The Dark Knight. Even so, it’s still a really strong action film. Still havent seen this!! hahahah It feels good not to give into pressure!! Hah, is there a certain reason you are avoiding this? Good review Eric. I’m very glad that after 50 years Bond still manages to remain relevant which is very, very impressive and I hope they keep it going too. Not perfect, but still very, very good in how it goes back to being old-school, but also shows some new-stuff as well. Thanks Dan, yeah this was a pretty good blend of old/new. Very solid action film overall. Glad you liked it! I gave the movie 8 too, it may be one of the best Bonds out there but I think that it’s still for being perfect. I noticed a lot of similarities to The Dark Knight, especially with the vilain, but now that I read your review it really does have parallels to TDKR as well. Excellent review and like you I’m not the biggest Bond fan either, but loved this movie. Thanks, Nostra! I honestly wasn’t expecting to like this one as much as I did, but it was a lot of fun. The only negative I could find in Skyfall was the motivation of the villain, which is somewhat unclear, especially what happens in the tube station scene. No problem, man, where did you go on holiday? Hope you had a great time! Yeah, I loved the opening scene as well. Definitely set the tone for what was to come, and I even liked the title sequence with Adele’s theme. I’m not a huge fan of her, but that song did it for me. Hopefully the next Bond film can build off of Skyfall’s momentum. Yep, it was a good holiday. I was in London, so got to see a few museums, and watch a bunch of 2012 cinema releases, which I’ll review tomorrow. Only thing is the cinema prices are higher there than normal, but that’s life. The first Bond films had quite a bit in common with the novels, but as you progress through them, they are further removed—and get progressively more disappointing. The suspense and feeling of menace that’s in the novels just wasn’t there in the later movies, it was replaced with explosions; and it seems the overall “dark” feeling has been ousted in favor of humor and a light-hearted feeling. It’s not that they aren’t fun to watch, but you have to remove your expectations beforehand and just accept them as they are. These latest movies, though, have come closer to what I expected—and wanted—out of Bond movies. Casino Royale was updated and adapted, but it still worked. 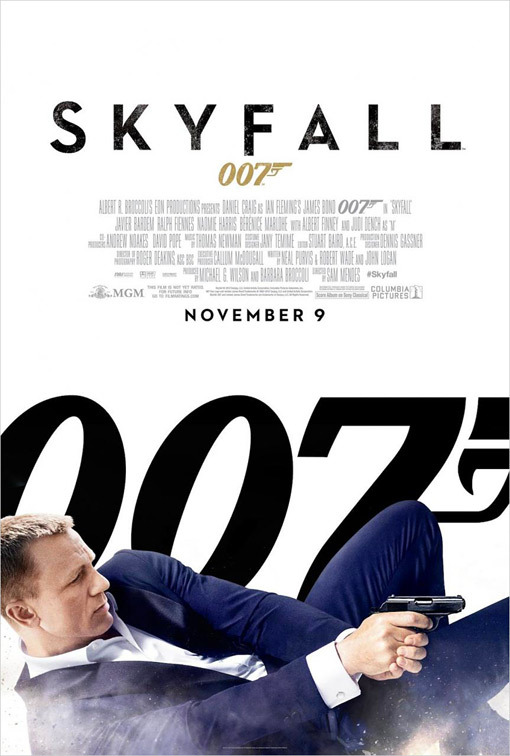 I’m a big fan and, even though I haven’t yet seen Skyfall, I’m really looking forward to it. It’s great to hear that Bond fans are really digging the Craig movies. If you’re a fan of the “dark” feeling, I think you’ll appreciate Skyfall even more. Plus from what I have gathered, there are all sorts of references and homages to past Bond flicks, a few of which had the audience going nuts at my screening. I hope you’re able to see it soon, Ais! 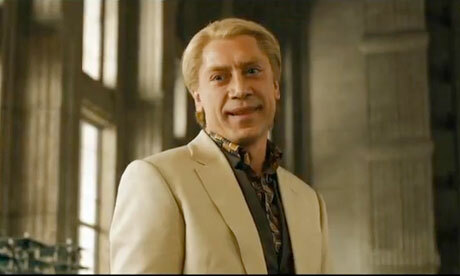 I have heard a lot of Bond fans calling Bardem one of the best villains in the series. Curious to hear what you think after seeing it!